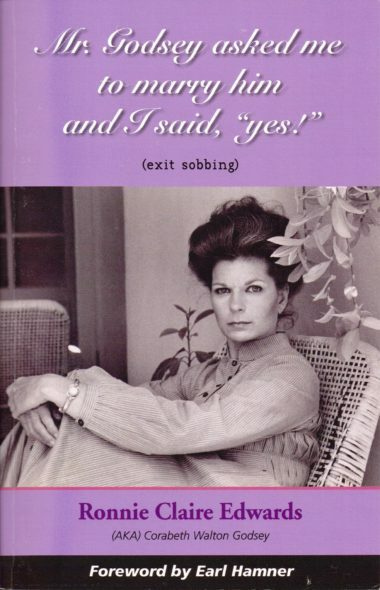 Actress Ronnie Claire Edwards, best known for playing Corabeth Walton Godsey, Ike Godsey’s (Joe Conley) wife on The Waltons TV series and sequel movies on CBS, has died at the age of 83. The Texas resident’s death was announced in a pair of posts on her Facebook page, on June 14, 2016. Edwards’ longtime co-star, Conley, passed away on July 7, 2013. 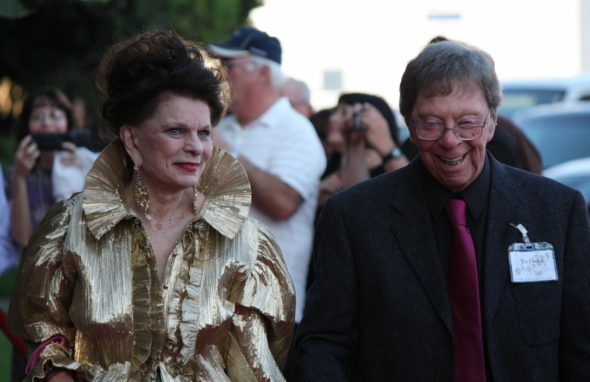 The two are pictured above, attending The Waltons TV show’s 40th Anniversary Reunion at the Wilshire Ebell Theater, in Los Angeles, CA on September 29, 2012. Edwards’ other TV series work includes the short-lived Boone TV series (1984-85 NBC), also from Waltons creator Earl Hamner, Jr. who died in March of this year. She was next in the cast of the Sara TV series (1985), starring Geena Davis in the title role, which was cancelled after 13 episodes. She recurred in NBC’s The Torkelsons (1991), which was renamed Almost Home in its second and final season. Her last television credit is for two episodes of HBO‘s 12 Miles of Bad Road, in 2007. Ms. Edwards wrote The Knife Thrower’s Assistant: Memoirs of a Human Target in 2000, with a forward by Fannie Flagg, and as pictured above, Mr. Godsey Asked Me to Marry Him and I said, “Yes!” (exit sobbing). In 2015, she self-published the book, This Is the Smartest Dog in the World. Edwards guest-starred on a number of notable TV series including Dallas (1984), Dynasty (1985), and on Falcon Crest (1985), which was also created by Hamner. She also had guest spots on Murder She Wrote (1988), Designing Women (1989), In the Heat of the Night (1990), and Stark Trek: The Next Generation (1994). EDWARDS, RONNIE CLAIRE (1933– ). Actress Ronnie Claire Edwards was born on February 9, 1933, in Oklahoma City, Oklahoma, the daughter of Warren Hamilton and Pauline Caroline Mills Edwards. Her father, a graduate of the University of Oklahoma (OU) Law School, was a lawyer and county attorney in Oklahoma City for more than sixty years. Her mother also graduated from OU and was a teacher and a writer. Ronnie Claire Edwards graduated from Classen High School, Oklahoma City, in 1951. By 1961 she had married Robert K. Sands. Before appearing on the professional stage, Edwards had an early start in public appearances. At age fifteen she left home to travel with a carnival around Oklahoma. She became the assistant of Great Shosone Mahaffee, billed as “half American Indian, half Irish, knife thrower extraordinaire.” Strapped to a spinning wheel, she had many exciting moments before her allergies to Oklahoma’s ragweed caused sneezing and ended her job as a moving target. Two years later Edwards performed melodrama as an amateur in an opera house and the adjoining Sluice Saloon in a Montana mining camp. Prior to being cast in the lead role in the musical production Paint Your Wagon in New York City in 1962, Edwards had performed in numerous theaters from Washington, D.C., to Los Angeles. She appeared on the stage of the Lyric Theatre when it opened in the early 1960s in Oklahoma City. Edwards has received three Los Angeles Dramalogue Awards for excellence in acting. She is best remembered as Corabeth Walton Godsey in the popular television series The Waltons, which aired from 1972 to 1981. She has also appeared in several episodes of the television series Designing Women. Some of her film credits include All the Way Home (1963), When Every Day Was the Fourth of July (1978), and 8 Seconds (1994). In addition to acting, Edwards has written several plays. With Georgia playwright Allen Crowe she wrote a two-act musical entitled Idols of The King, which pays tribute to Elvis Presley. It premiered at the Arkansas Repertory Theatre in 1997. She also wrote the one-woman show The Knife Thrower’s Assistant, loosely based on her autobiography of the same title, and the one-woman show The True Story of the Incarnation of Little Egypt. Edwards coauthored the plays The Last of the Honky Tonk Angels and Wedding Belles as well as the musical Cowboy based on the life of Western artist Charles Russell. In 1994 Edwards wrote and privately printed a cookbook filled with recipes, photographs, and anecdotes entitled Sugar and Grease (paint) for the Walton’s Mountain Museum in Schuyler, Virginia. Her autobiography The Knife Thrower’s Assistant: Memoirs of a Human Target was published in 2000. In 2014 she lived in Dallas, Texas. 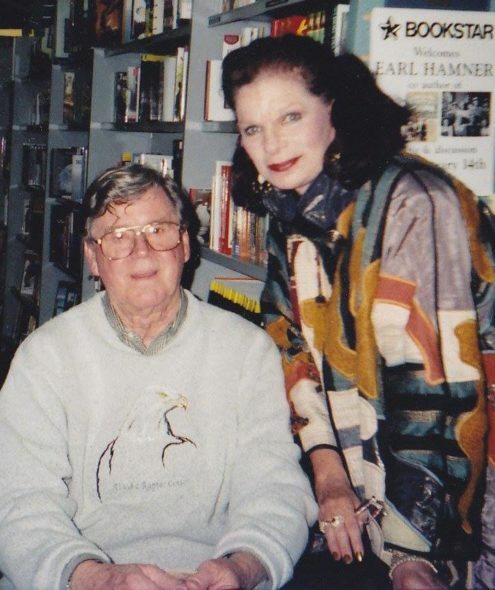 The Waltons: Creator Earl Hamner with Ronnie Claire Edwards. Via Facebook. This marks the third death The Waltons TV show family has suffered in 2016. In addition to Hamner’s passing, William Schallert died on May 8, of this year. Star Ralph Waite (John Walton) died in February 2014, at the age of the 85. We invite you to share your memories of Ms. Edwards and her career, below. More about: 12 Miles of Bad Road, Almost Home, Boone, Dallas, Designing Women, Dynasty (1981), Falcon Crest, In the Heat of the Night, Murder She Wrote, Sara, Star Trek: The Next Generation, Star Trek: The Next Generation: canceled or renewed?, The Torkelsons, The Waltons, The Waltons: canceled or renewed? Murder, She Wrote: Angela Lansbury on Reboot; A Different Title? I enjoy this show today,its about family and hard work. Something that people theses days know very little about, I don’t know much about family myself,maybe it’s why I like the show? But keep playing it on vision Tv in Canada / Ontario please.